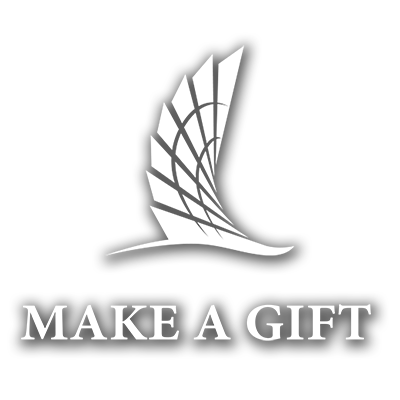 CORPUS CHRISTI, Texas – The McNair Scholars Program at Texas A&M University-Corpus Christi provides low-income, first-generation and under-represented undergraduate students with premier higher learning experiences such as opportunities in research, attending national academic conferences and other scholarly activities. 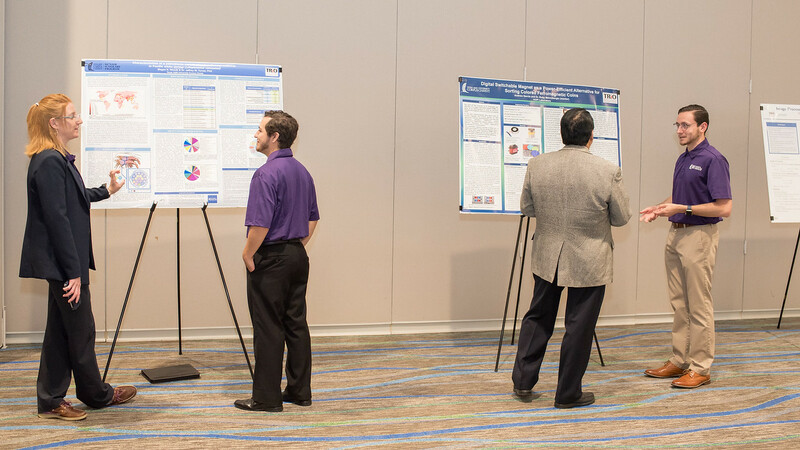 Students chosen as McNair Scholars often pursue doctoral degrees in highly-competitive programs. 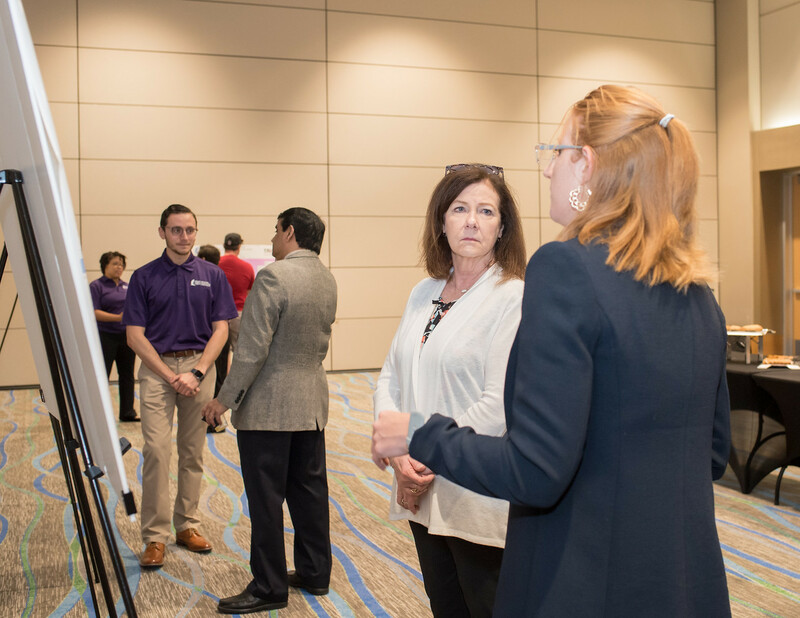 In celebration of their efforts and impact in academia, Islander McNair Scholars, faculty mentors and staff were recognized at “McNair Day” events on April 18. “The McNair Scholar Research Poster Presenters and Faculty Mentor Recognition Luncheon are held every year not only to spotlight the program’s highly talented student researchers, but also to thank faculty mentors and staff who have helped these students achieve success,” shared Dr. Patricia Spaniol-Mathews, executive director of the McNair Scholars Program. 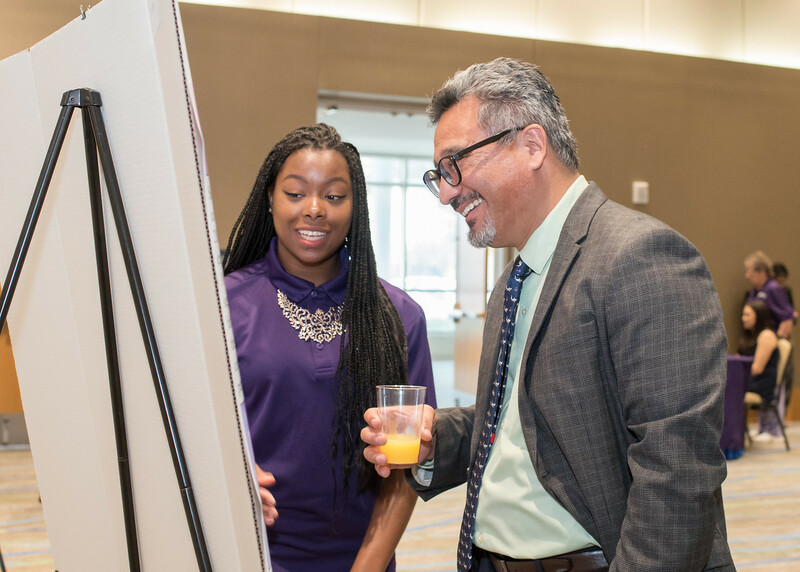 Dr. Gerardo Moreno, associate vice president for Academic Affairs, was honored at the luncheon for his commitment and advocacy for student success in the Programs for Academic Student Support (PASS). His leadership efforts have increased McNair Scholar research projects and academic knowledge. Shakira Barnes, a senior studying psychology, presented “Negotiation for Meaning: Views on Sexual Consent in Relationships” with her mentor, Dr. Olga V. Berkout, assistant professor of psychology. 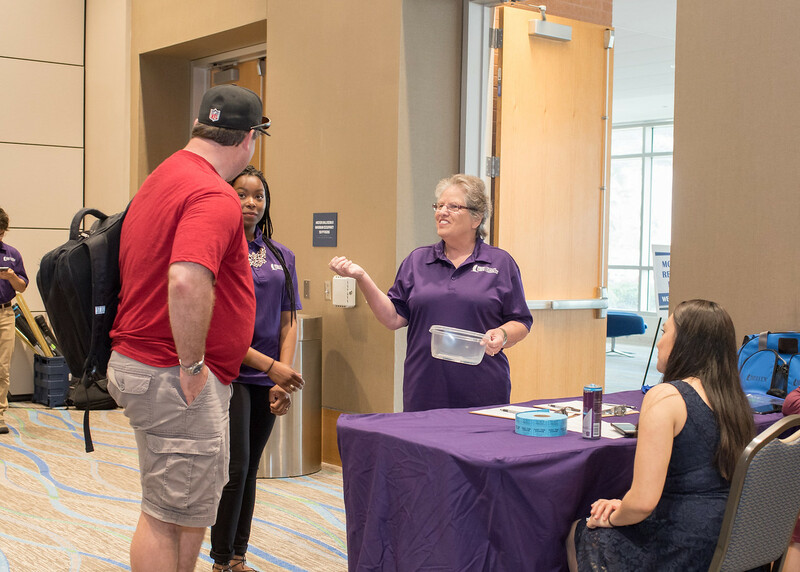 Barnes surveyed more than 300 students from Texas A&M-Corpus Christi on their understanding of sexual consent based on the relationship between perpetrator and victim, the use of alcohol and prior sexual involvement to study the relationship between the three variables and their impact on the perception of consent. 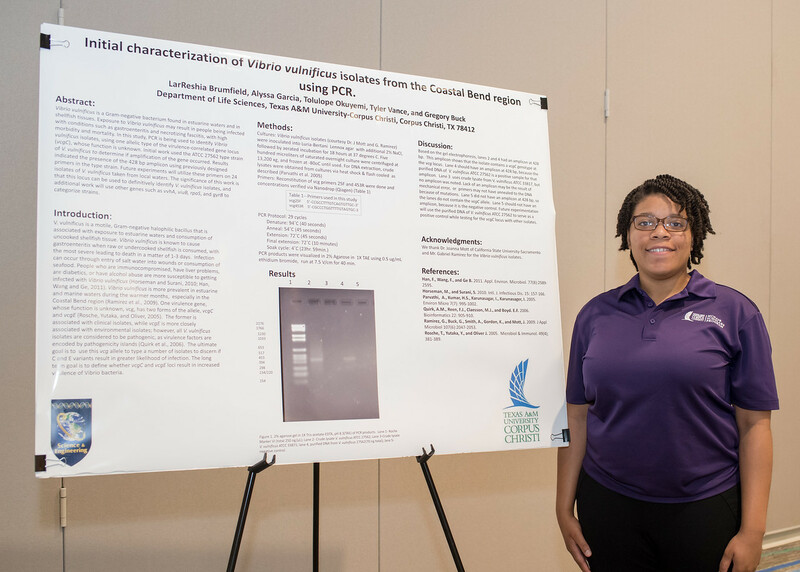 LarReshia Brumfield, a junior studying biomedical sciences, presented “Initial Characterization of Vibrio vulnificus Isolates from the Coastal Bend Region using PCR” with her mentor, Dr. Gregory Buck, associate professor of biology and biomedical sciences. 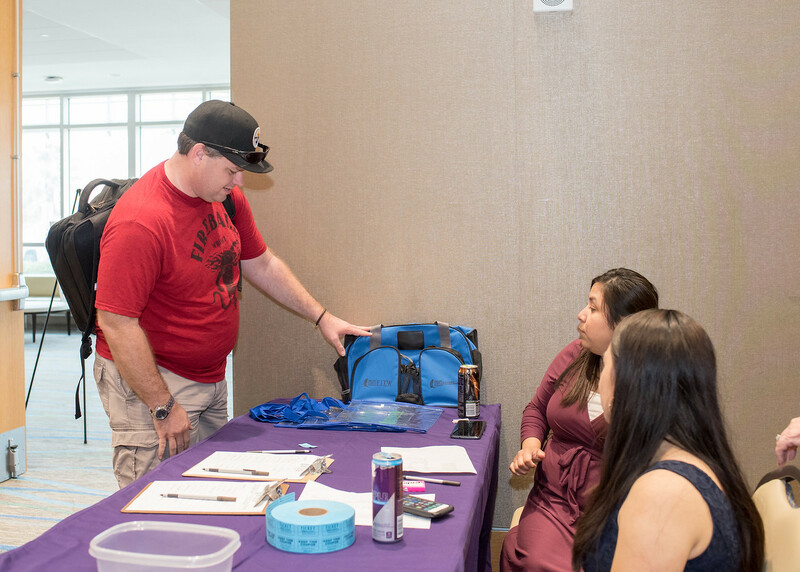 Brumfield studied bacteria found in estuarine and marine waters as well as the tissues of shellfish and the skin of finfish that are known to cause diseases such as stomach flu, flesh-eating disease and primary septicemia. 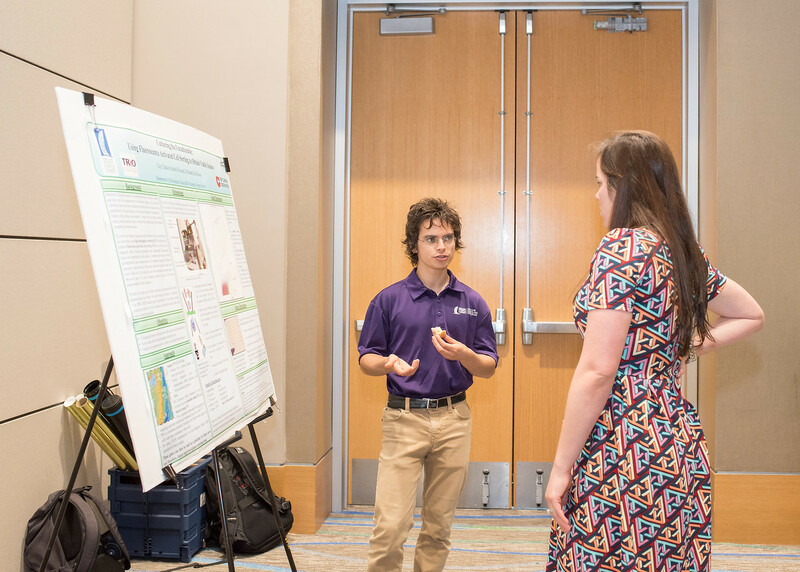 Clay Clarkson, a junior studying cellular and molecular biology, presented “Culturing the Unculturable: Using Fluorescence Activated Cell Sorting to Obtain Viable Isolates” with his mentor, Dr. Brandi Kiel Reese, assistant professor of microbial ecology. Clarkson participated in the creation of an innovative technique that opens opportunities for developing unique culturing methods for under-represented microbial species. 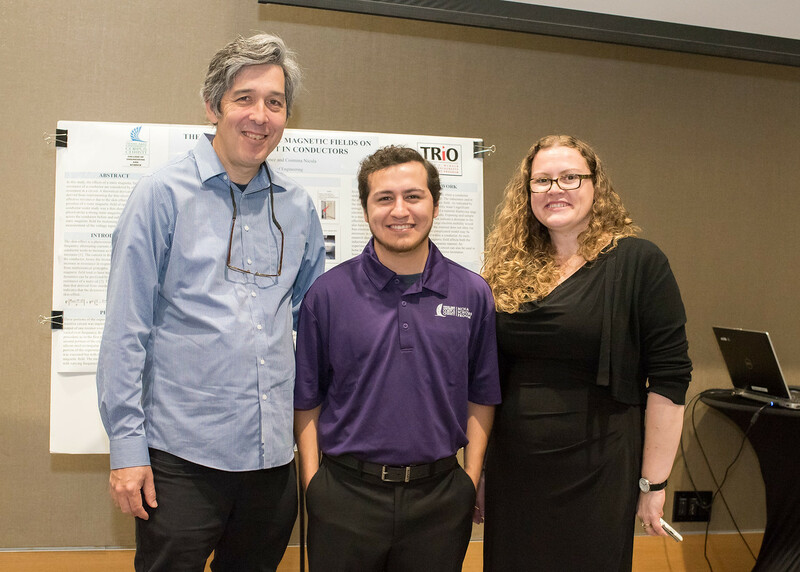 Alfonso Cohuo, a senior studying marine biology, presented “Condition as an Indicator of Resilience to Hypoxia by Atlantic Croaker in the Northern Gulf Mexico” with his mentor, Dr. Benjamin Walther, assistant professor of life sciences. Cohuo studied the effects of hypoxia in coastal waters on the growth of Atlantic croaker. 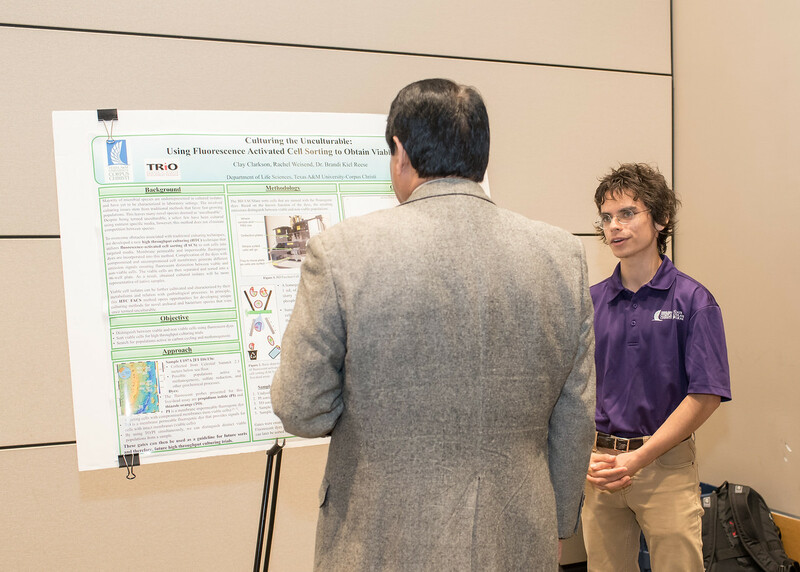 Andrew Garcia, a junior studying electrical engineering, presented “Digital Switchable Magnets used to Sort Ferromagnetic Colored Coins” with his mentor, Dr. Ruby Mehrubeoglu, professor of engineering and program coordinator of the Department of Engineering. 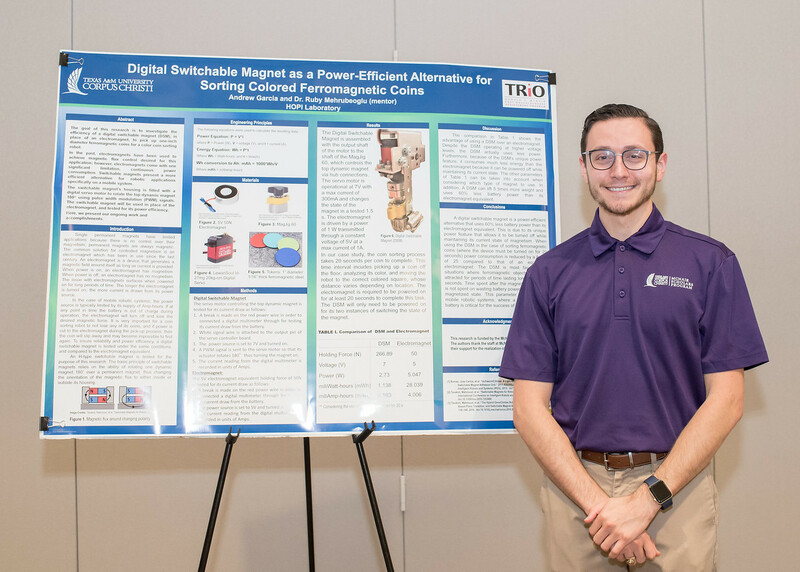 Garcia investigated the efficiency of a digital switchable magnet, in place of an electromagnet, to pick up one-inch ferromagnetic coins for a color coin sorting robot. 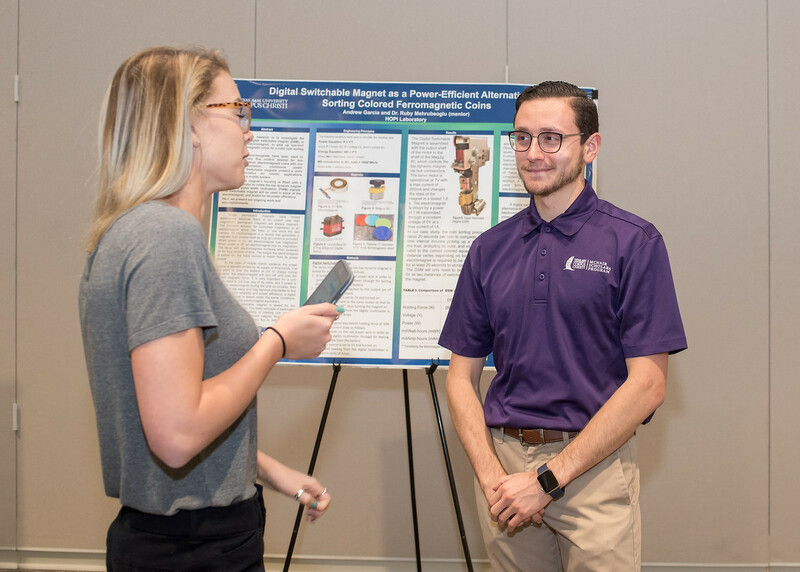 Michael Martinez, a senior studying electrical engineering, presented “The Effects of Static Magnetic Fields on the Effect in Conductors” with his mentor, Dr. Cosmina Nicula, adjunct professor of engineering. Martinez studied the resistance of a conductor by measuring it before and indirectly after the application of a static magnetic field for increasing values of frequency by changing voltage ratios. Doina Morales, a senior studying electrical engineering, presented “Autonomous Navigation of Controlled Game Environment Matrix Utilizing Point Comparison of Real and Ideal Image Regions” with her mentor Dr. Ruby Mehrubeoglu, professor of engineering and program coordinator of the Department of Engineering. Morales used image enhancement and segmentation methods to detect tokens, such as colored squares or circles, to see if a combination of image processing, mapping and navigation is necessary for robots to understand their environments. 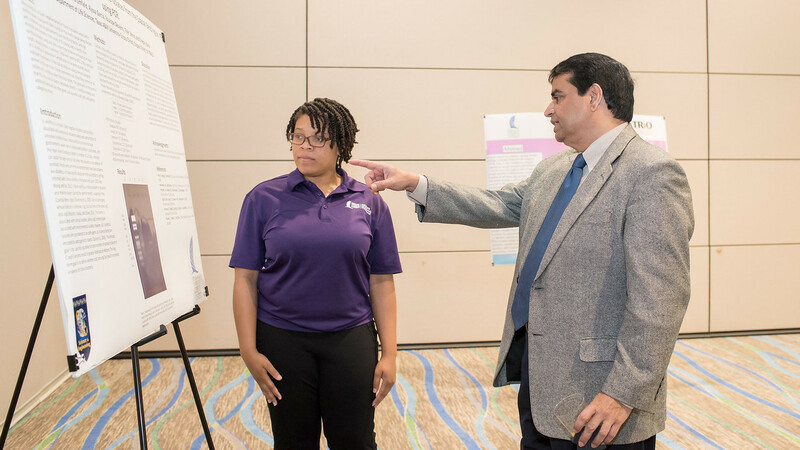 Zoe Ramos, a senior studying chemistry, presented “Effects of pH and Counterion Choice of the Chiral Separation of Binaphthyl Derivatives by L-undecyl-leucine Surfactants” with her mentor, Dr. Fereshteh Billiot, associate professor chemistry. 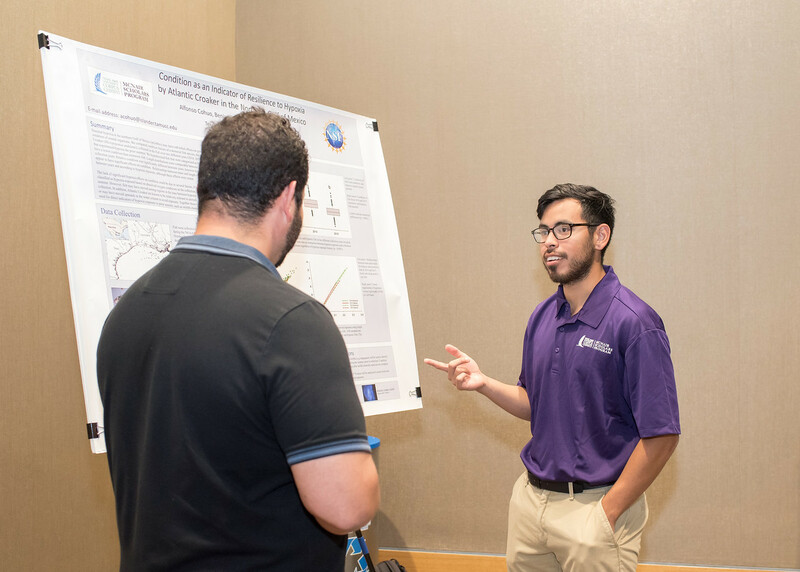 Ramos investigated the nature of chiral interactions in the amino acid based surfactant L-undecyl-leucine through comparing the performance of arginine and sodium counterions. 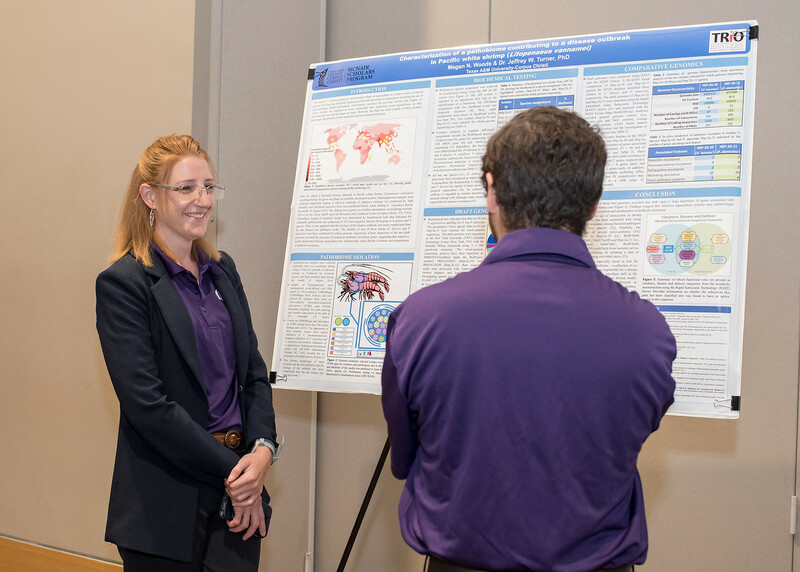 Megan Woods, a senior studying marine biology, presented “Characterization of a Pathobiome Contributing to a Disease Outbreak in Pacific White Shrimp (Litopenaeus vannamei)” with her mentor, Dr. Jeffrey Turner, assistant professor of marine biology. Woods investigated a bacterial disease outbreak in Pacific white shrimp through biochemical testing, genome sequencing and comparative genomics.